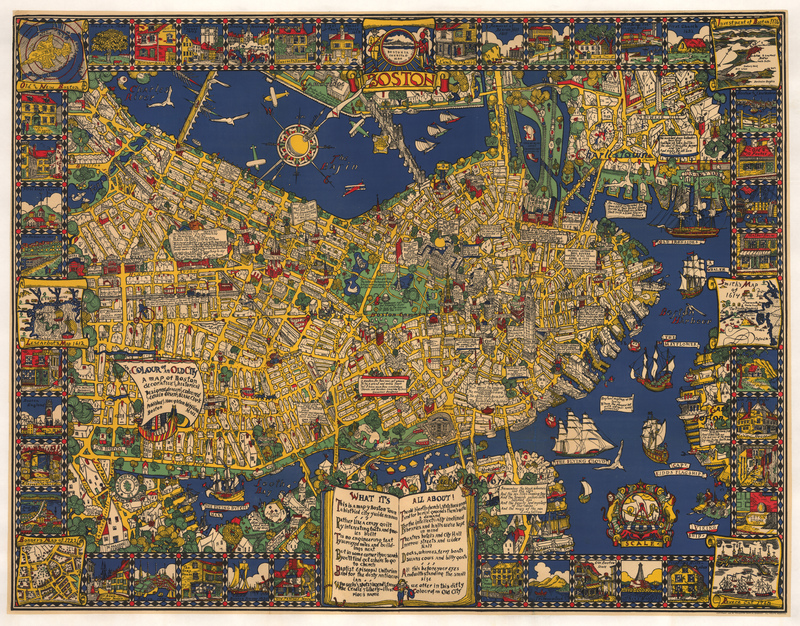 This charming pictorial map of Boston is considered one of the finest of its genre for its size, its vibrant color and its rich supply of both information and wit. The map was the result of the first collaboration of two young draftsmen and architects, Edwin Olsen and Blake Clark, who were said to have spent six months in exhaustive study and incessant sketching. The result of their efforts is a marvelous pictorial map which is filled with graphic and verbal details about the city, its history, many of its inhabitants and even legendary and mythical observations, all rendered with a light and humorous touch. The wealth of information it contains makes this a great map to explore, one which never fails to reveal new secrets. Details of the old city abound, as much of it was more readily visible at the time the map was created, and access to those places much easier than today. Streets are named. Smaller buildings and larger, well-known and important architectural edifices are all rendered so as to be recognizable. Historical details include depictions of sites such as Charles St. Gaol where a man languishes in stocks, Quincy Market, Faneuil Hall, and the Old State House, to name just a few. Biplanes swarm over the city and seagoing ships and vessels of various flags, eras and styles ply the waters. The map’s title is depicted on the sail of a Norse longboat floating above Albany Street and another similar vessel makes its way intrepidly toward the city proper, both a nod to the idea that Vikings had sailed the Charles River several centuries before other Europeans were to arrive. The map’s border consists of a series of square-shaped framed sketches of various historical places and events, and points of interest pertaining to Boston and its environs. Small maps are also inset in a number of places in the border: ‘Lescarbot’s Map of 1612’; ‘Smith’s Map of 1614’; ‘Bonner’s Map of 1722’; ‘Revere Cut of 1760’; ‘Investment of Boston, 1776’; and ‘Old and New Boston’. Condition: This charming and vibrant map is in A+ condition and has been linen backed for the purpose of preservation.